The last place you want to encounter a weather-related satellite router malfunction is in the middle of nowhere, whether that be in the desert or jungle. Let’s say, for example, you’re hiking in full uniform with a lot of SATCOM gear through a hot, dry, mountainous terrain to a specific predetermined location. Your one job is to set up a remote SATCOM station. The heat is absolutely brutal — the temperature has reached 95 degrees Fahrenheit but it really feels like 115, especially under all that gear you’re carrying. In short, you’re miserable. You don’t think it could get much worse, until you finally reach your destination and pull out your router. The timing couldn’t be more perfect — a massive dust storm, also known as a haboob, strikes out of nowhere. Dust, sand and all sorts of indeterminable debris swirls around you, caking everything with dust — including your SATCOM gear. However, this is no ordinary dust storm, oh no — a thunderstorm comes crashing down soon after, turning all that dust into thick, gloopy mud. What was once clean, pristine SATCOM gear has quickly become something reminiscent of a mud pie. Under any other circumstance, you would thrust your fists to the sky and curse the heavens for absolutely ruining your router after trekking what felt like two marathon distances in the hot desert climate. But this isn’t any normal circumstance and you haven’t brought just any SATCOM gear. Instead, you knock the mud off your satellite router and power it on, no problem. The router cheerfully lights up, ready to complete the mission at hand. This hardy satellite router, the 9050 OM, was officially introduced by the iDirect Government (iDirectGov) team in May at the SOFIC 2018 show in Tampa, Florida. 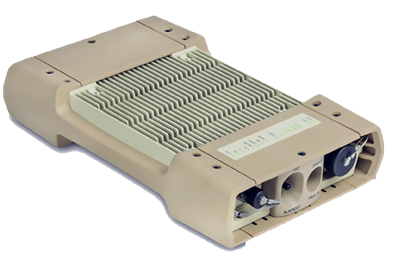 The company’s 9050 OM is a lightweight, ruggedized enclosure specifically designed to house and protect the company’s powerful 950mp Integrated Satellite Router Board. The revolutionary element about this product is not its significantly reduced size, weight and power (SWaP), but rather the product’s resistance to the elements. The 9050 OM is dust- and water-resistant, making it ideal to operate in either desert or monsoon-like conditions – or both, like the soldier in the story above. Before its release, the 9050 OM underwent many rigorous rounds of MIL-STD 810G compliance testing to guarantee that it will stay operational even in the thick of the storm. iDirectGov test engineers heated the unit to 140 degrees Fahrenheit (60 degrees Celsius) before submerging it in 36 inches (91.45 centimeters) of water, which caused the unit’s temperature to drop drastically. This test allowed the potential for water to be sucked in due to the rapid change in temperature. After 30 minutes, test engineers removed the 9050 OM, and there was no evidence of water penetration into the unit. It was able to power up without any problems, working just as it was designed to work. The 9050 OM also passed other tests, including vibration/loose cargo, shock, drop, immersion, dust, altitude and blowing rain. Although in extreme weather conditions, teams don’t typically turn on satellite systems; there’s just too much rain fade for any signal to get through. iDirectGov designed the 9050 OM for customers already using man portable terminals, such as the company’s 950mp, and other customers operating with portable satellite terminals. iDirect Government’s 9050 OM satellite router enclosure. Because satellite communication systems operate outdoors, the firm saw the need to develop an enclosure unit that would allow customers to work without worrying about the weather conditions or carrying large, heavy transit cases to protect their equipment from the elements — or even survive being kicked out of an airplane. For smaller teams, taking the less-is-more approach is ideal. With this 9050 OM, the operator needs only to use an antenna and modem — no extra gear or transit cases needed — and be connected in minutes. This solution helps minimize the amount of gear to where an integrated satellite router board can operate in outdoor environments. The offering is designed to be completely enclosed and protected from the elements. iDirectGov even went a step further — the 9050 OM can basically be beaten up and abused yet still be operational. Although the big selling point of the 9050 OM is its ability to withstand the elements, product engineers did not hold back on enhancing the transmission security (TRANSEC) features. Since the 9050 OM is fully operational on the company’s most powerful Major Defense-Based Release of Evolution 4.2 software, it has all the TRANSEC bells and whistles customers require. The 9050 OM is FIPS 140-2 Level 3 certified, WGS certification ready and boasts upgraded TRANSEC features, which include being able to detect and respond to attempts at physical access or modifications made to the cryptographic module. This takes the security level up a notch from Level 2, which only requires a tamper-evident coating or seals to be placed on products that must be broken to gain access to cryptographic keys and critical security parameters. With a more secure FIPS certification comes an even more secure TRANSEC. Not only does the 9050 OM — like the rest of the company’s 9-Series product line — support two-way TRANSEC, it also now supports one-way TRANSEC, as well. Now, secure broadcast communications can be sent to receive-only terminals, helping to protect against man-in-the-middle attacks. As a security measure, product engineers at iDirectGov added a zeroize button to the 9050 OM, which erases all security keys from the TRANSEC module, guaranteeing the adversary does not gain access to the network. Product engineers also included a LED blackout switch for nighttime missions, plus an antenna pointing meter to provide a visual indication of a receive signal from the satellite above. Compared to similar products on the market, the 9050 OM is lighter and consumes less than 20 watts of power to operate — a considerable amount less than its competitors. Plus, the iDirectGov platform is more widely used in the defense marketplace when compared to other offerings. According to the spec-sheet located on the iDirectGov website, the 9050 OM weighs only 6.54 pounds (2.97 kilograms) and can operate at temperatures as cold as minus 40 degrees Fahrenheit (minus 40 degrees Celsius) and as warm as 131 degrees Fahrenheit (55 Celsius). The 9050 OM is operational as high as 15,000 feet (4,572 meters) and can be stored as high as 50,000 feet (15,240 meters) in temperatures that range from minus 40 degrees Fahrenheit (minus 40 degrees Celsius) to 176 degrees Fahrenheit (80 degrees Celsius). Its network topology has DVB-S2 with Adaptive TDMA Returns, and it boasts maximum rates of 45 Msps downstream and 29 Msps upstream. For more information on the 9050 OM, visit the iDirectGov website at www.idirectgov.com.